Tropical Depression Jolina was estimated at West of Subic, Zambales, as of 4:00 am today, and continuously moving Northwest at 11 kph. Jolina will exit PAR on Wednesday. PAGASA's 5 a.m. weather bulletin said that as of 4 a.m., Tropical Depression Jolina was estimated at 390 km west of Subic, Zambales. The rainfall amount of tropical depression Jolina is from 5 - 15 mm per hour (moderate - heavy) within the 300 km diameter. 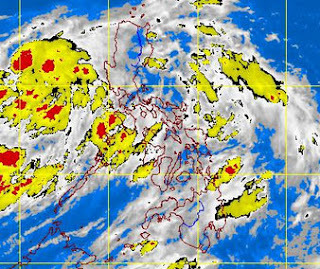 PAGASA said Mimaropa and Calabarzon may expect "cloudy skies with moderate to occasionally heavy rain showers and thunderstorms which may trigger flash floods and landslides." Comments or suggestions about "Tropical Depression Jolina Update | July 31, 2013" is important to us, you may share it by using the comment box below.